I’ve been told by a lot of people that this, the third and final installment in the Hunger Games trilogy, was their least favorite of the three, so I went into it with that expectation. However, I am here to say that I enjoyed it just as much as the first two – maybe even a smidge more than the second book, Catching Fire. Against all odds, Katniss Everdeen has survived not one, but two Hunger Games. Catching Fire ended with her being plucked from the arena by rebel forces. Now she finds herself in the not-so-mythical-after-all District 13, her native District 12 having been burned to the ground. 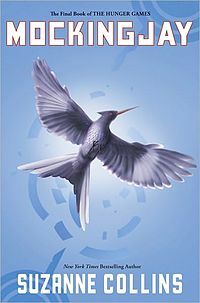 District 13 is the headquarters of the rebel cause, and plans are being made to overthrow President Snow and the Capitol. President Snow wants revenge against Katniss, and Katniss finds herself a pawn yet again in a larger scale Hunger Games than she ever imagined – the future of all of Panem seems to teeter on the outcome of this attempted overthrow. And I’m not going to say anymore, because I don’t want to give anything away to anyone who has not yet read this one. I will say that it’s full of action, suspense, and surprises. My hat is off, once again, to Suzanne Collins for creating such a memorable hero in Katniss Everdeen. She breaks all gender boundaries and is a hero that both boys and girls can look up to (I know, because my 15-year old son thinks she’s awesome). She’s flawed and very human, and while “romance” is an element in this series, she is very conflicted about her feelings towards her male counterparts and never allows them to define or rule her. I really admire this girl!